Step 1 Heat the oven to 350 degrees. Generously butter 6 (one-half cup) ramekins or baking cups. Place the raisins in a small bowl and cover them with the Bourbon until they soften slightly, about 30 minutes. Place the almonds on a baking sheet and toast in the oven until they are fragrant and have darkened slightly, about 3 to 4 minutes. Step 2 To prepare the topping, combine the almonds, flour, 2 tablespoons sugar and the salt in the work bowl of a food processor. Pulse 2 or 3 times to chop the almonds coarsely; you don't want them finely ground. In Recipes-list.com we have selected the most viewed recipes from category - Desserts . Enjoy the best recipes specially selected for you! 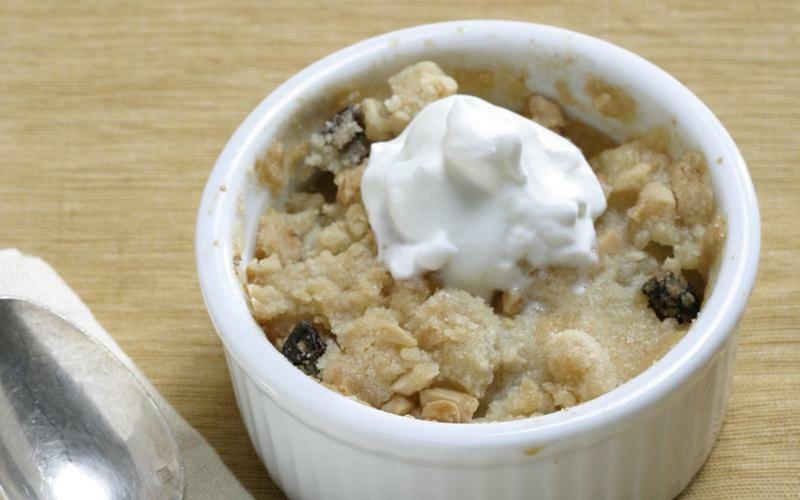 Asian pear crisp with almond topping is the right choice that will satisfy all your claims.